Prefranked covers - PHILATELIC SERVICE - S.F. 1990. Definitive issue (4) - nr. 1.1 - Stars - 75 x 36 mm. 1.2 - Stars - 75 x 37 mm. 2 - No stars - 75 x 36 mm. HOW TO SHOW THE PRICES AND BUY ? 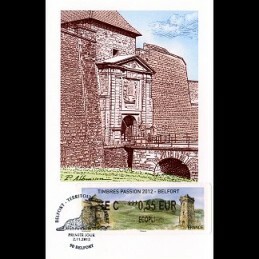 (2-4.11.2012) - Timbres Passion 2012 - Belfort. Stamps exhibition catalogue - programme, 72 pages. FREE if bought along with some material of this page, over 20 EUR. Not valid with the shipping free offer for orders over 100 EUR. The price corresponds to the additional shipping costs because the weight catalogue. IER - LISA 2 (2.11.2012) - Timbres Passion 2012 - Belfort. Mint TEST label. IER - LISA 2 (2.11.2012) - Timbres Passion 2012 - Belfort. 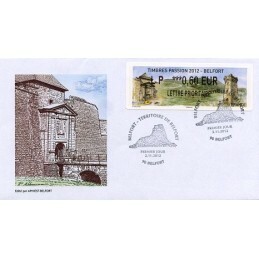 ATM small value (0,01 EUR), pictorial post office postmark Philatelie - Belfort Theatre. IER - LISA 2 (2.11.2012) - Timbres Passion 2012 - Belfort. 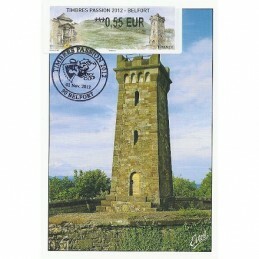 ATM inland value (0,55 EUR), pictorial first day postmark Timbres Passion 2012. IER - LISA 2 (2.11.2012) - Timbres Passion 2012 - Belfort. 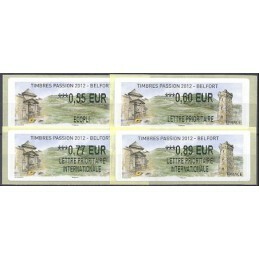 ATM inland value (0,60 EUR LETTRE PRIORITAIRE), pictorial first day postmark Belfort - Territoire de Belfort. IER - LISA 2 (2.11.2012) - Timbres Passion 2012 - Belfort. Mint ATM small value (0,01 EUR). IER - LISA 2 (2.11.2012) - Timbres Passion 2012 - Belfort. Mint ATM domestic value (0,55 EUR ECOPLI). IER - LISA 2 (2.11.2012) - Timbres Passion 2012 - Belfort. Mint ATM domestic value (0,55 EUR). IER - LISA 2 (2.11.2012) - Timbres Passion 2012 - Belfort. Mint ATM domestic value - new indicators (EC 0,55 EUR ECOPLI). IER - LISA 2 (2.11.2012) - Timbres Passion 2012 - Belfort. 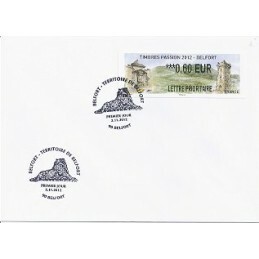 First day cover mailed to Poste Restante (0,60 EUR LETTRE PRIORITAIRE). 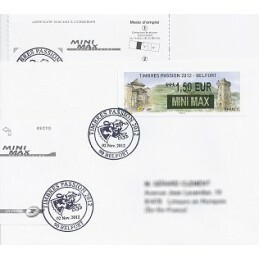 Pictorial postmark Timbres Passion 2012. Poste Restante postal marks on the back. IER - LISA 2 (2.11.2012) - Timbres Passion 2012 - Belfort. 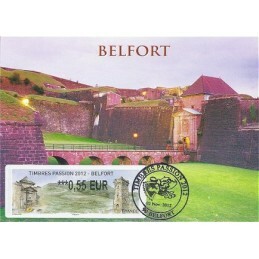 First day cover, with ATM (0,60 EUR LETTRE PRIORITAIRE) and pictorial postmark Belfort - Territoire de Belfort. IER - LISA 2 (2.11.2012) - Timbres Passion 2012 - Belfort. 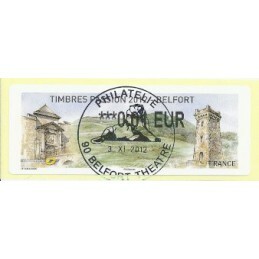 Cover with ATM - new postage indicators (EC 0,55 EUR ECOPLI) and pictorial post office postmark Philatelie - Belfort Theatre. IER - LISA 2 (2.11.2012) - Timbres Passion 2012 - Belfort. 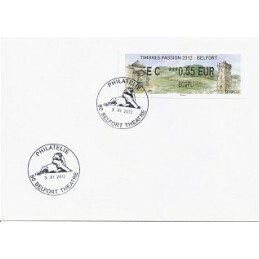 Pictorial cover with ATM - new postage indicators (LP 0,60 EUR LETTRE PRIORITAIRE) and pictorial postmark Belfort - Territoire de Belfort. IER - LISA 2 (2.11.2012) - Timbres Passion 2012 - Belfort. 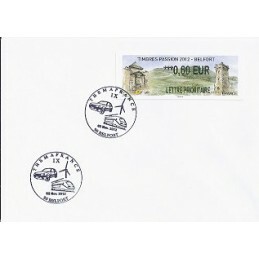 First day cover, with ATM (1,50 EUR MINI MAX) and pictorial postmark. With receipt. IER - LISA 2 (2.11.2012) - Timbres Passion 2012 - Belfort. 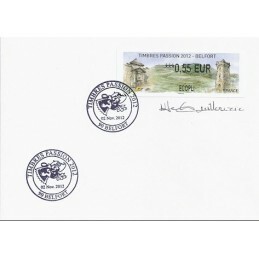 First day cover, with ATM (0,55 EUR ECOPLI) and pictorial postmark Timbres Passion 2012. Signed by the ATM designer. IER - LISA 2 (2.11.2012) - Timbres Passion 2012 - Belfort. 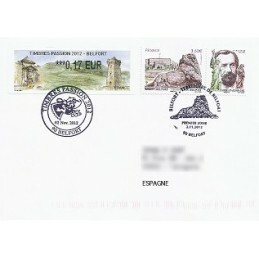 First day cover mailed to Spain (0,77 EUR LETTRE PRIORITAIRE INTERNATIONALE), with pictorial postmark. With postal indexation. IER - LISA 2 (2.11.2012) - Timbres Passion 2012 - Belfort. First day cover mailed to Spain, with Belfort stamp and franking complement with ATM (0,17 EUR), with two pictorial postmarks and postal indexation. IER - LISA 2 (2.11.2012) - Timbres Passion 2012 - Belfort. 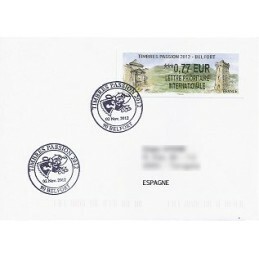 First day cover, with ATM (0,60 EUR LETTRE PRIORITAIRE) and pictorial postmark Themafrance. FRANCE (2012). 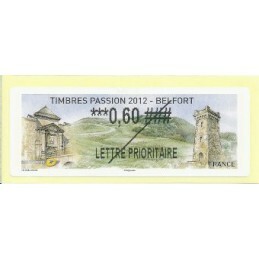 Timbres Passion Belfort. Set 4 val. IER - LISA 2 (2.11.2012) - Timbres Passion 2012 - Belfort. Mint set 4 values (0,55 ECOPLI - 0,60 LETTRE PRIORITAIRE - 0,77 LETTRE PRIORITAIRE INTERNATIONALE - 0,89 LETTRE PRIORITAIRE INTERNATIONALE). FRANCE (2012). 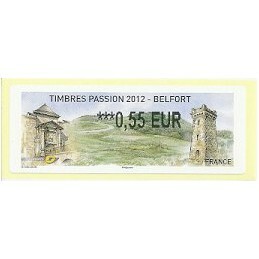 Timbres Passion Belfort. Set 6 val. IER - LISA 2 (2.11.2012) - Timbres Passion 2012 - Belfort. 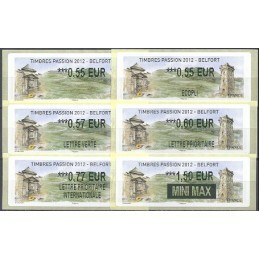 Mint set 6 values (0,55 - 0,55 ECOPLI - 0,57 LETTRE VERTE - 0,60 LETTRE PRIORITAIRE - 0,77 LETTRE PRIORITAIRE INTERNATIONALE - 1,50 MINI MAX). FRANCE (2012). 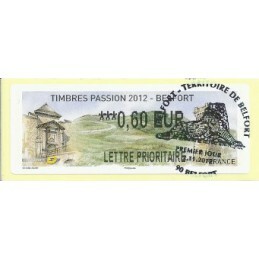 Timbres Passion Belfort. Set 8 val. IER - LISA 2 (2.11.2012) - Timbres Passion 2012 - Belfort. Mint set 8 values (0,55 - 0,55 ECOPLI - 0,57 LETTRE VERTE - 0,60 LETTRE PRIORITAIRE - 0,77 LETTRE PRIORITAIRE INTERNATIONALE - 1,50 MINI MAX - 2,00 PETIT PAQUET PRIORITAIRE INTERNATIONAL - 3,38 LETTRE RECOMMANDEE R1). --- (2.11.2012) - Timbres Passion 2012 - Belfort. Maximum card with stamp and pictorial first day postmark. Commercial postcard, Editions Valoire - Estel - Blois. IER - LISA 2 (2.11.2012) - Timbres Passion 2012 - Belfort. 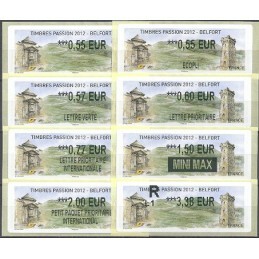 Maximum card with ATM - new indicators (EC 0,55 EUR ECOPLI) and pictorial first day postmark Belfort - Territoire de Belfort. IER - LISA 2 (2.11.2012) - Timbres Passion 2012 - Belfort. Maximum card with ATM (0,55 EUR) and pictorial first day postmark. Commercial postcard, Editions Combier - Mâcon. IER - LISA 2 (2.11.2012) - Timbres Passion 2012 - Belfort. Maximum card with ATM (0,55 EUR) and pictorial first day postmark. Commercial postcard, Editions Estel Blois.